We are instrumental in providing Heavy Duty Wheelbarrows that are used to carry and shift baggage, farm products, bricks, sand and other material. Wheelbarrows are made using high grade material and are available in many sizes and specifications. The coating on the surface enhances the resistance of the barrows against the corrosion. We provides Wheel Barrows at reasonbale prices. Among our wide range of products, we are offering a wide range of Construction Wheelbarrow. - Capacity: 6 cu.ft/250 kg. 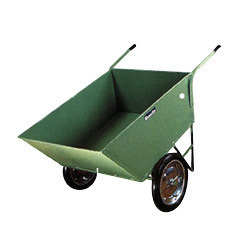 We are a renowned manufacturer if a line of durable and reliable construction wheelbarrow. Our wheelbarrows are specially designed for efficient transportation of concrete. DISCRIPTION: Green fodder trolley is Easiest way and convenient way of feeding and cleaning in dairy farms. Various sizes available. In order to keep pace with the never ending demands of customers, we are involved into offering wide range of Double Wheel Barrow Trolley. Our clients can avail from us premier quality Garden Hand Trolley, which is precisely fabricated at our state-of-the-art manufacturing facility. We make use of finest material and components procured from reliable sources for its fabrication. Further, we have framed a quality management program as per which entire process is thoroughly monitored and offerings are meticulously tested. 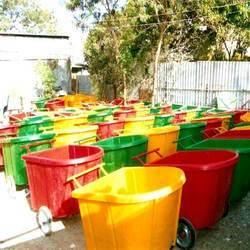 We bring forth an extensive range of Wheel Barrows (MWB 101) to our valuable clients. Our product range is strictly inspected on various parameters before delivering to our clients. These products are fabricated from high grade raw material as per the defined quality standards. Clients can avail these products at market leading prices.